Mushrooms are in season right now and are such a great way to add local produce into your weekly menu. From mild flavored white button mushrooms to portobello's earthy flavor, there is a mushroom that can be added to most any style of cooking. The following is a rundown of how to select, prep, and cook these amazing members of the fungus family. Maitake mushrooms are also called “Hen of the Woods.” They have a distinctive aroma and a rich, woodsy taste. To prepare maitakes, sauté lightly in butter or oil. How To Use Them: Maitakes add a richer taste in any recipe calling for mushrooms. They can be a main dish ingredient or used in side dishes and soups. 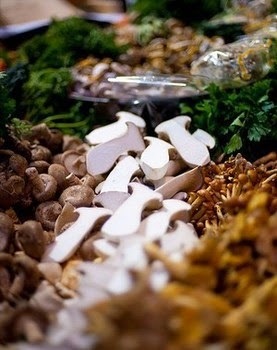 Choose mushrooms with a firm, unblemished skin. Reject any that are damp, soggy or withered. Mushrooms should have an earthy, but pleasant scent. If you are not going to use the mushrooms immediately, buy whole instead of sliced, to lengthen their freshness in the refrigerator. 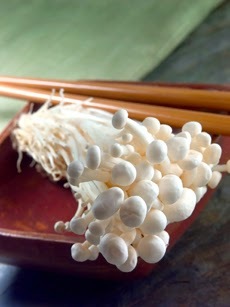 Mushrooms are a food that should be bought organic, when possible, as the skin is being eaten. Modern mushroom farming often uses synthetic chemicals to increase production. Use a damp paper towel to wipe the mushroom clean. Trim the end of the stem off, or break it off completely. Unused stems can be used in making homemade beef or vegetable broth, to enhance the flavor. There are dozens and dozens of ways to cook mushrooms (many are good for eating raw as well). Here are simple instructions for grilling any of the larger varieties of mushrooms: Brush cleaned mushrooms with olive oil, season with salt and pepper. Place on heated grill or grill pan and cook until tender (about 12 minutes), turning often. For portobello, grill cap down for 10-15 minutes on a hot grill or grill pan. Turn over for the last 2 minutes of cooking.